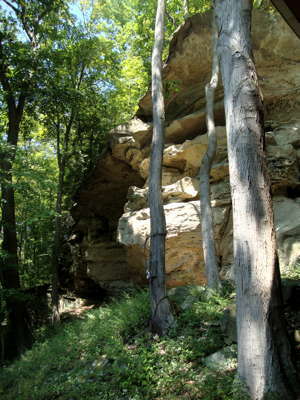 Meadowcroft Rockshelter has been continually inhabited for 16 000 years. It is an archaeological site on the north bank of Cross Creek, located near Avella in Washington County, in southwestern Pennsylvania, United States. 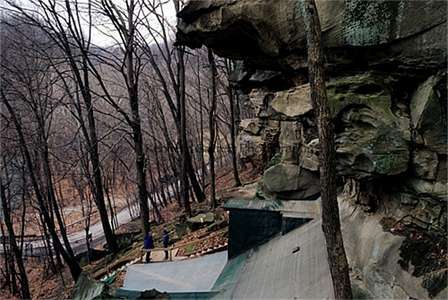 The site, a rock shelter in a bluff overlooking Cross Creek (a tributary of the Ohio River) is located about 36 miles west-southwest of Pittsburgh. 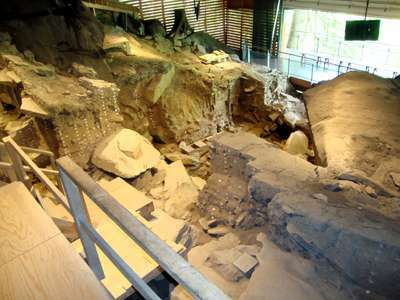 The artifacts from the site show the area has been continually inhabited for 16 000 years, since Paleo-Indian times. 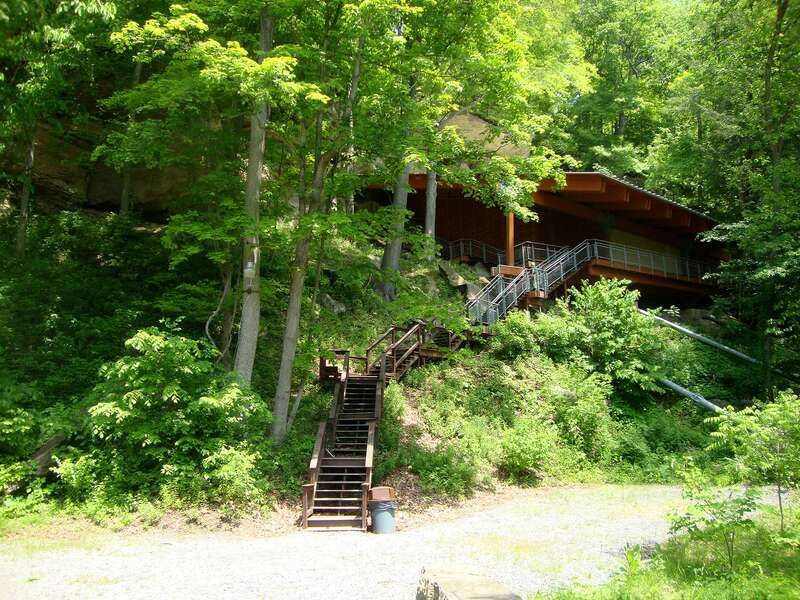 Meadowcroft Rockshelter was one of the first archaeological sites in the United States to contain evidence of pre-Clovis populations. The opening of the shelter faces dues south, and is about 90 feet or 27 metres across. 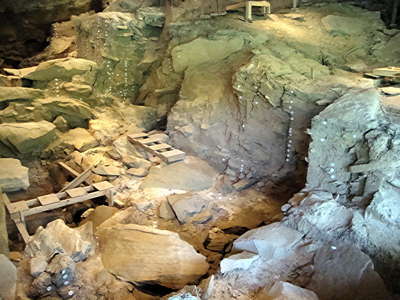 About 25 feet or 8 metres was excavated right in the middle from front to back. Nine metres, or 25 to 30 feet was left on either side of this trench for future excavation. 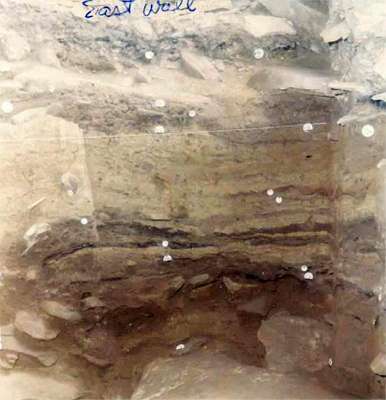 Multiple radiocarbon dates were obtained from the bottom cultural layer, dating to about 16 000 BP. 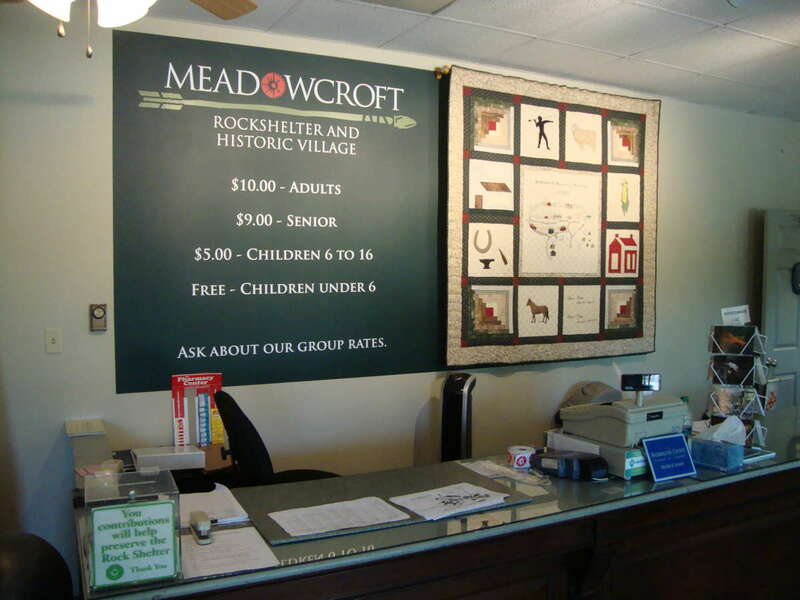 Meadowcroft had never been a permanent settlement. 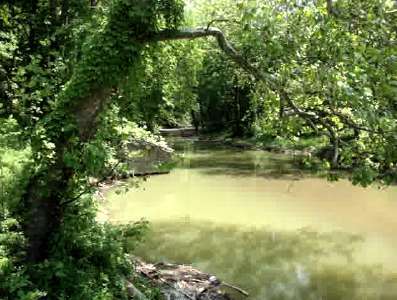 This site was located on an important route westward. The Paleo-Indians stuck to the river paths, and stayed a week or two at the most. Thus there are no burials, no human remains, no permanent fixtures to be found. 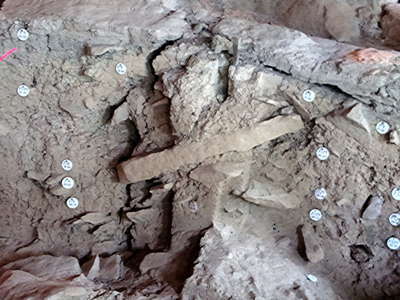 Adavasio's team found evidence of fires, pieces of basketry and woven mats, animal bones, and spear and arrow points and the shards of flint and chert left when the points were being made. In later layers they also found pieces of pottery. The view to Cross Creek and the road to the historical village. 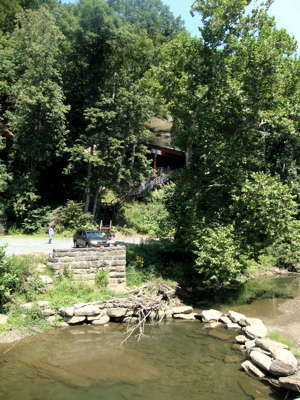 The rock shelter is close by a historical village recreation. The area is well serviced by good roads. 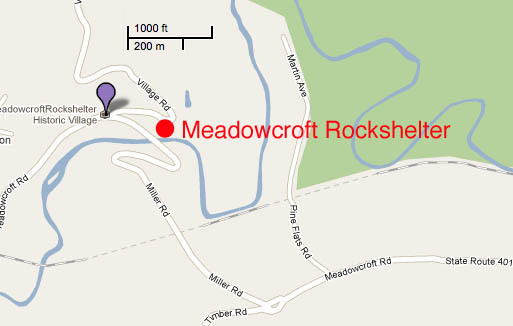 Photo: Adapted from Google Maps. View of the initial excavation trench at Meadowcroft Rockshelter, Washington County, PA, circa 1973. 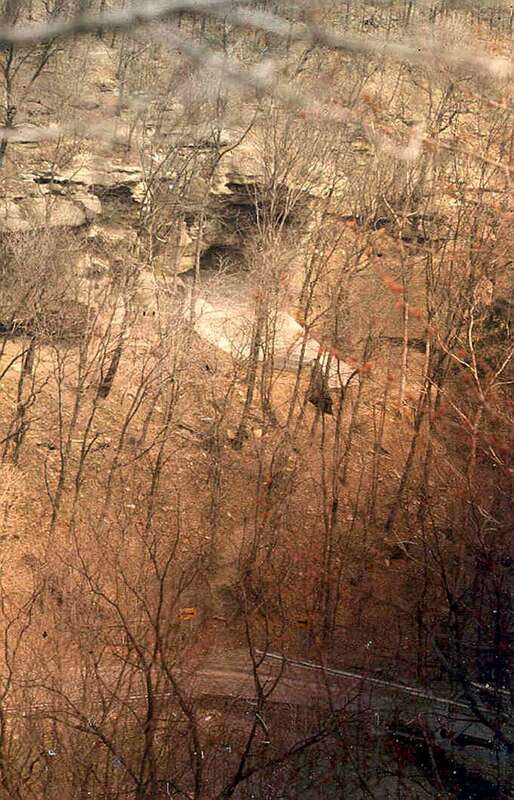 Archeologists dug the initial excavation trench at Meadowcroft Rockshelter, seen in this photograph from the early 1970s, to assess the nature of soils and the cultural deposits located both inside and outside the rockshelter's roofline. 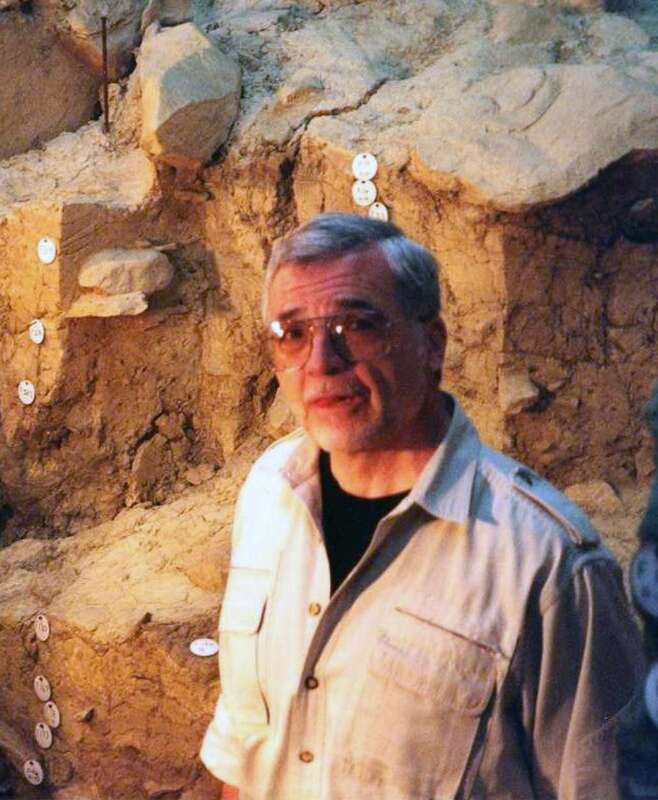 Photo credit: Dr. J. M. Adovasio, Mercyhurst Archaeological Institute. 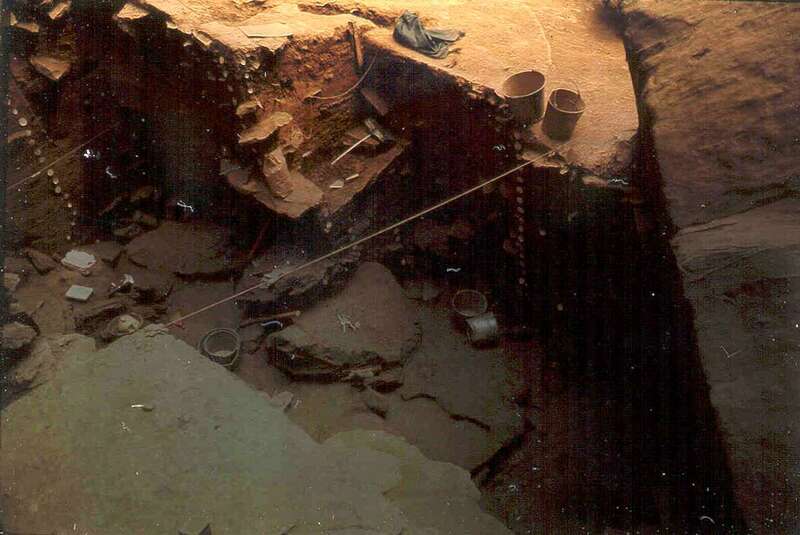 View of the eastern face of the excavation under the drip line. 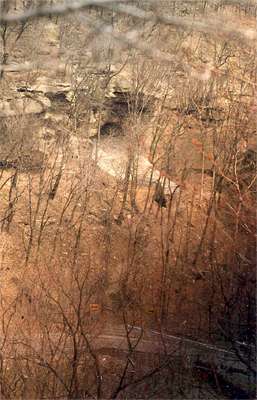 View of the "Deep Hole" excavations where the Paleoindian materials were recovered. 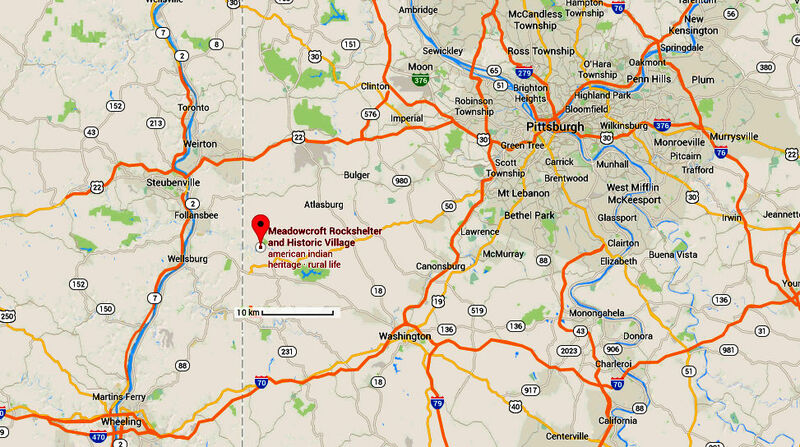 The earliest remains from Meadowcroft did not come from excavations within the drip-line of the rockshelter. 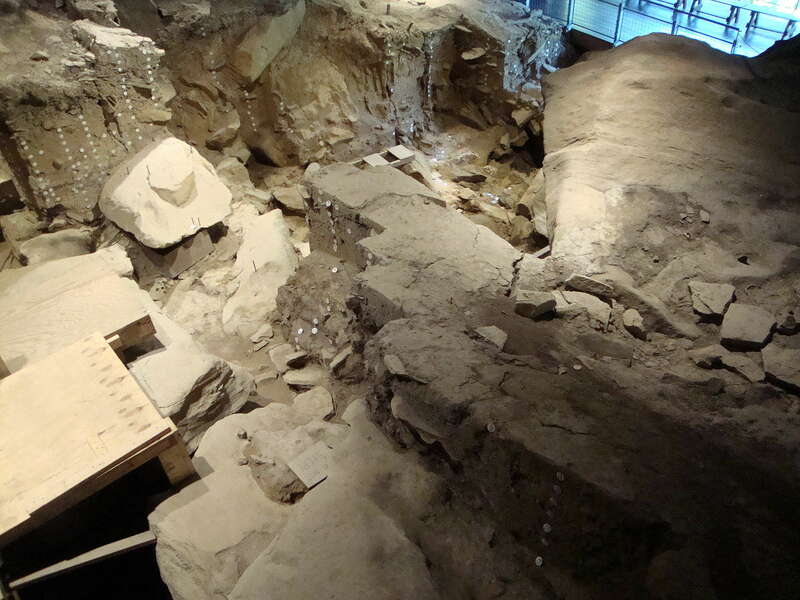 Most came from the area excavated beside the Old Roof Fall, shown here on the right. 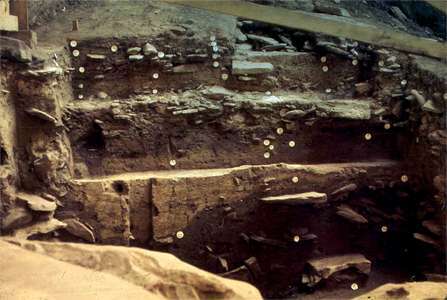 View of profile wall in the "Deep Hole". 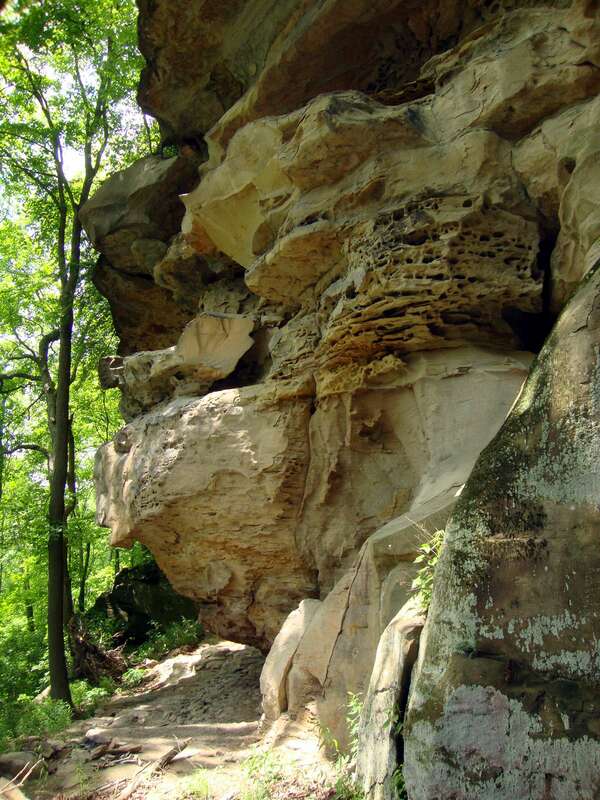 Paleoindian materials came from the lowest levels shown. Selected Bifaces from Paleoindian levels. 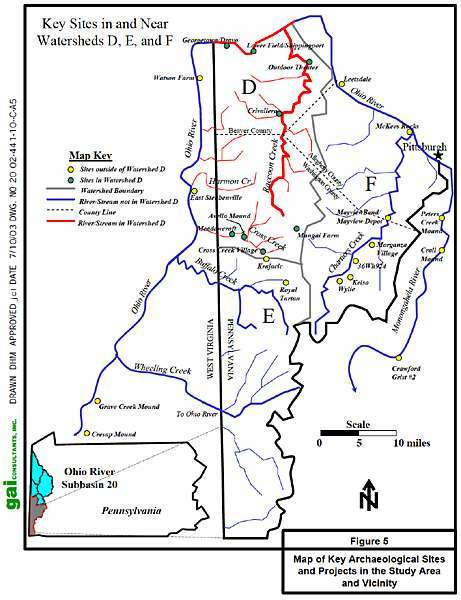 Mungai Knife is the center biface. Lamellar Blades from Paleoindian levels. The Pre-Clovis lithic assemblage from Meadowcroft is comprised of flaking debris, blades, a large flake knife (the Mungai Knife), and a lanceolate projectile point — the Miller Point. 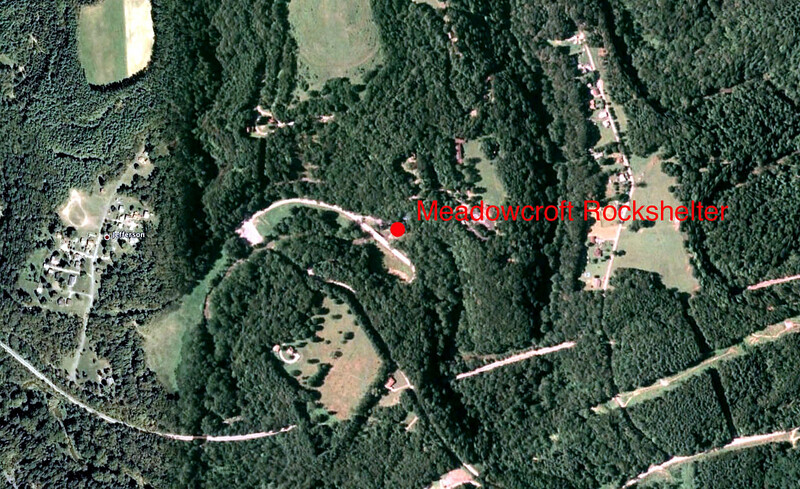 The Miller point from Meadowcroft is small, lanceolate, and was produced from fine-grained local chert. 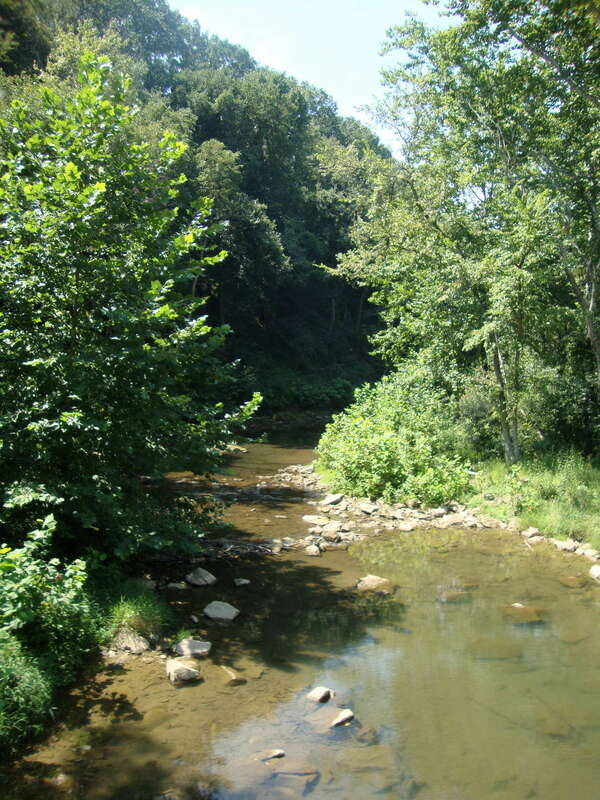 While the geologic provenance for the chert is uncertain, it is found locally (pers. 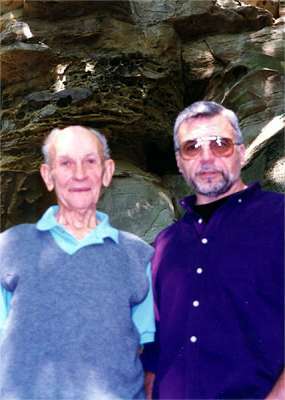 comm.. J. Adovasio, June 2003) and is opaque and light gray, with yellow and purple striations on both faces. 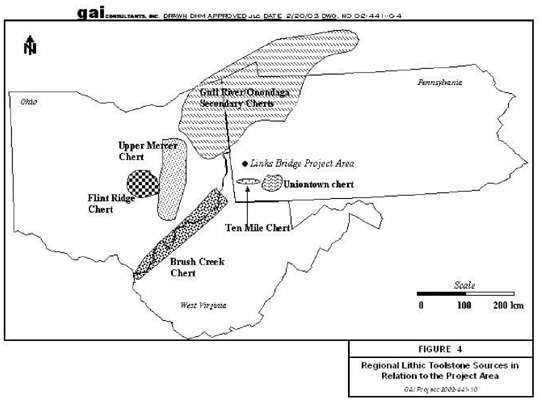 Boldurian (1985) describes the Miller point as having a distinctive base with straight margins that "articulate with the straight basal attribute margin at angles of 97 degrees." 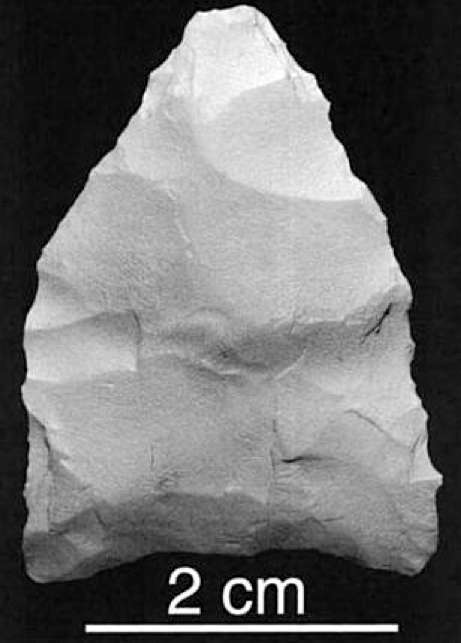 The point was produced via the removal of parallel, overlapping biface thinning flakes, most of which traverse the centerline to create a lenticular cross-section. 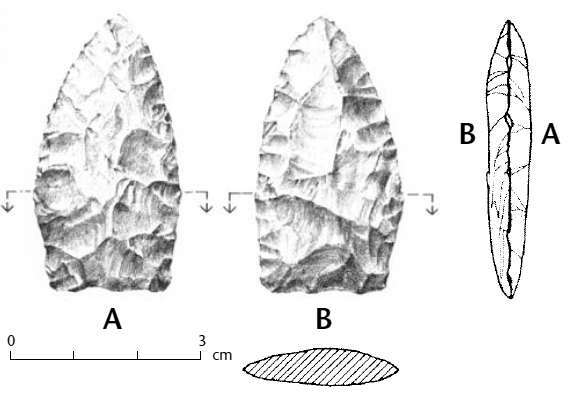 Personal examination of the point revealed slight unifacial bevelling PA Prehistoric Data Synthesis, Raccoon Creek Watershed 23 along two lateral margins, suggesting possible retouching for use as a knife. 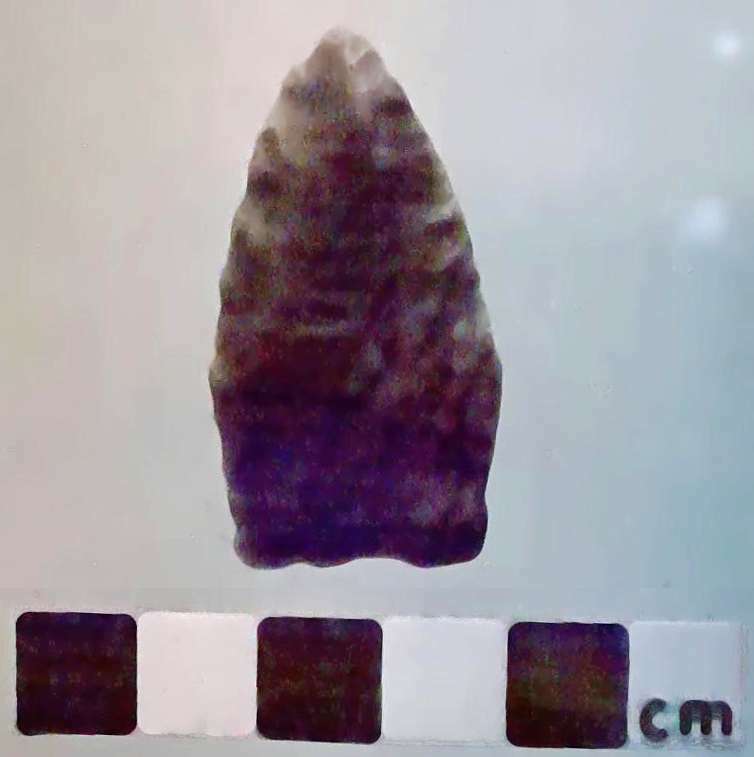 The Miller Lanceolate point, named for Albert Miller, the owner of the site and the man who first realised the potential of the site for the study of early humans in the Americas. Photo and text: Meadowcroft Rockshelter and Historic Village Collection. The Miller point was named for Meadowcroft Rockshelter discoverer Albert Miller, and was made from local stone 12 000 years ago. Thinning of the base is "unique," including lateral thinning on one face, and lateral and end thinning on the opposite face. Slight grinding is also present on all portions of the base to prepare it for hafting. 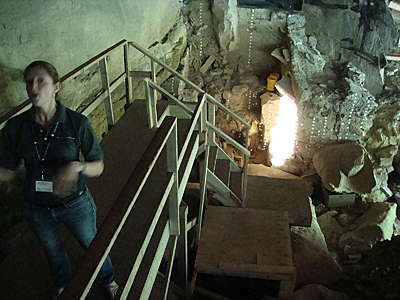 The Krajacic Site, located on a hilltop ca. 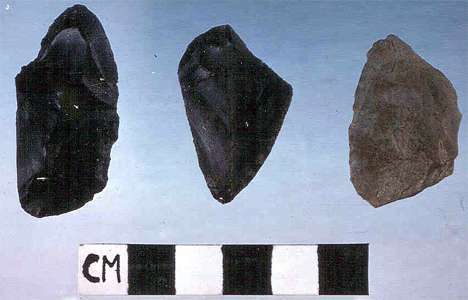 10 miles southeast of Meadowcroft, yielded fragments of possible Miller points in various stages of biface reduction, each of which contribute to the notion that the points fit a Paleoindian reduction pattern. 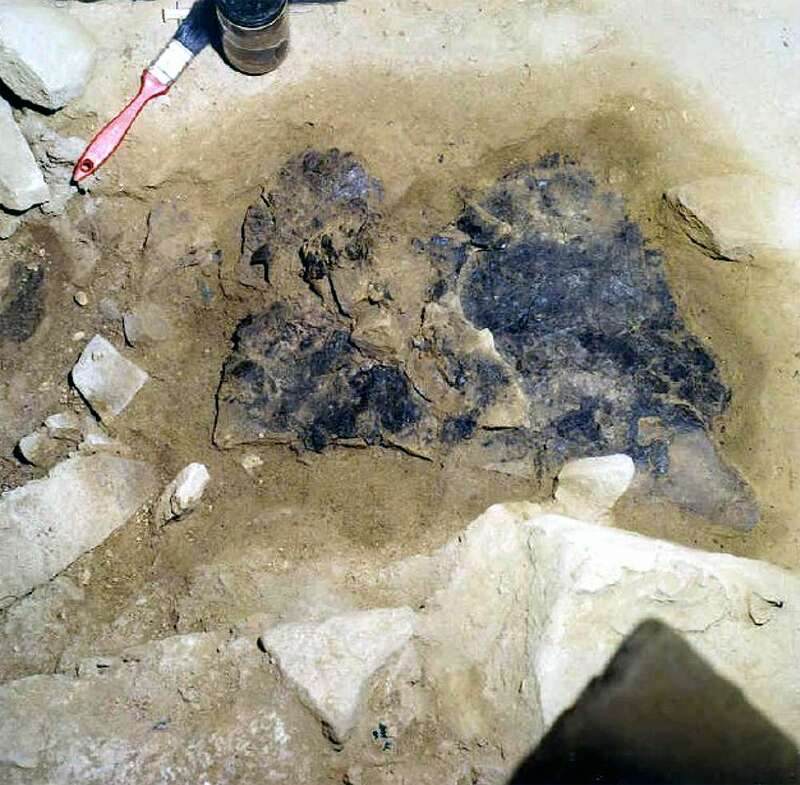 Photo: S. Patricia, courtesy of J. M. Adovasio, Mercyhurst Archaeological Institute, Erie, Pennsylvania. 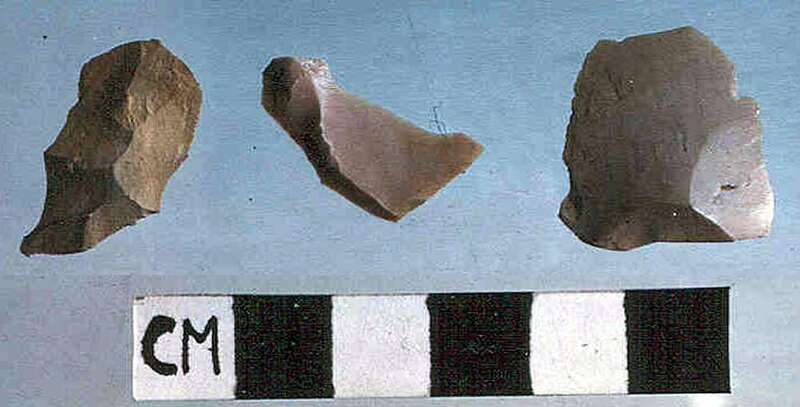 A triangular projectile point from Cactus Hill Virginia, very similar to other points from sites such as Meadowcroft, and the Miller point from there in particular. Photo: From a cast in the collections of the Anthropology Dept, National Museum of Natural History, courtesy of Dennis Stanford. Lithic Assemblage from Meadowcroft Rockshelter. 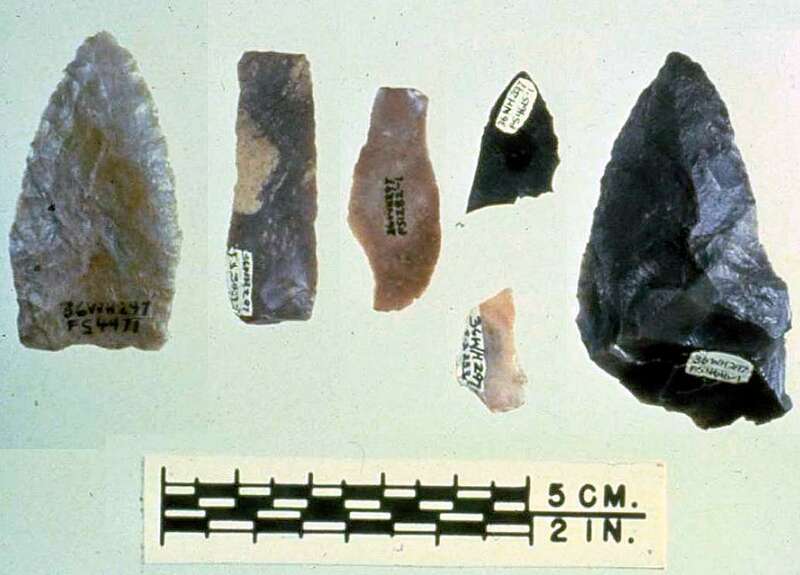 Archaeologists uncovered a wide variety of lithic artifacts from the Rockshelter, including these projectile points and tools. 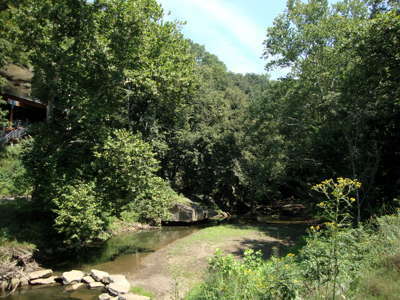 The Miller Lanceolate point, named for Albert Miller, is at left. 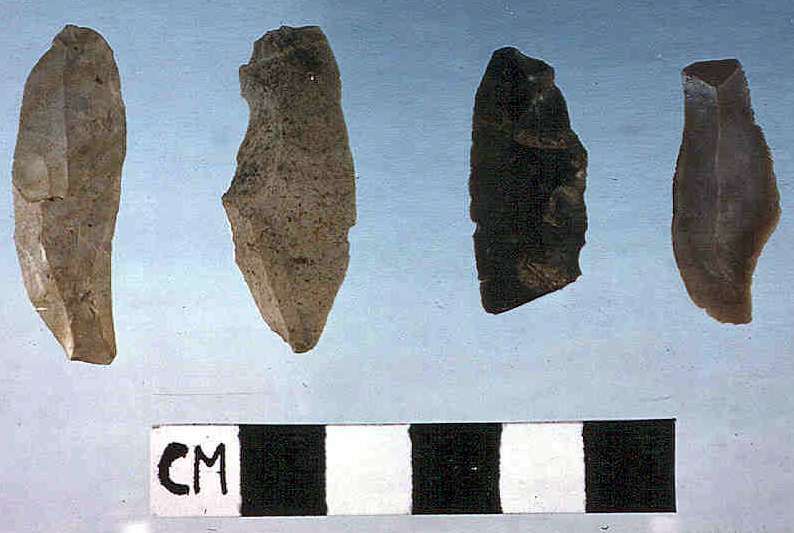 Examples of small prismatic blades from Meadowcroft Rockshelter (36WH297). 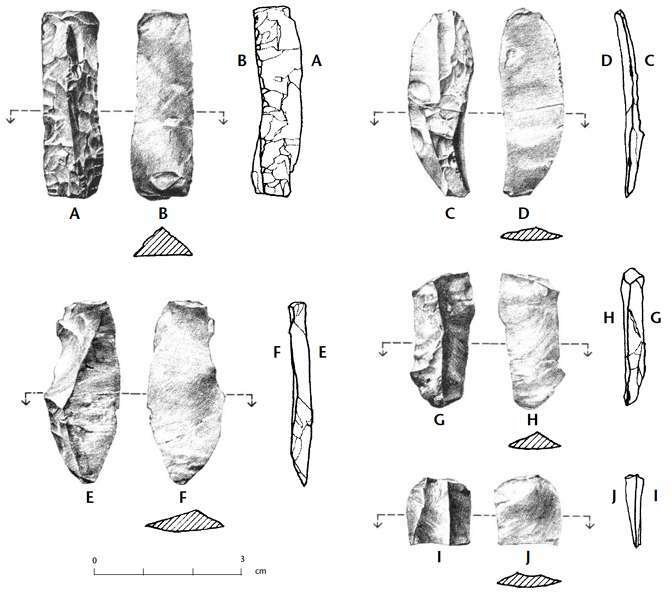 The first drawing at the top left of this image is the same blade as the second from the left in the image above of lithic artifacts. Archaic Period Points found in levels above the Paleoindian materials. Left to right: Stanley Point, Savannah River-like, Savannah River-like, Savannah River-like, Untyped Side Notched. 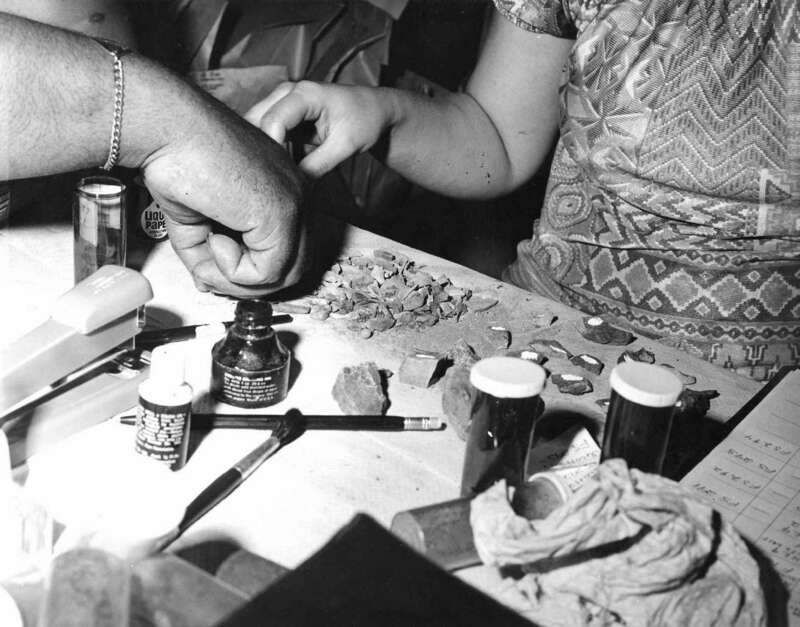 Archaeologists carefully remove the dirt from a dig so they can see a profile of the site. This profile is a sideways look at the history of the site. A profile helps archaeologists understand the site’s stratigraphy. The archaeologist is pointing at a dark spot on the wall profile. 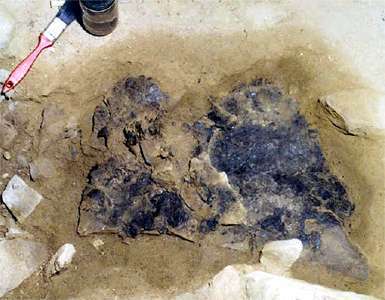 The dark color indicates a cultural feature. 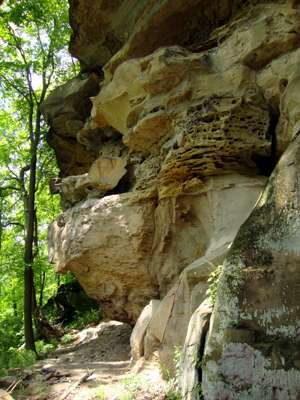 Archaeologists located many cultural features at the rockshelter. The red area (F16B) in this photograph shows the location of a prehistoric firefloor. Cultural feature F336 is the profile of a hole that was dug through a firefloor and later filled in. 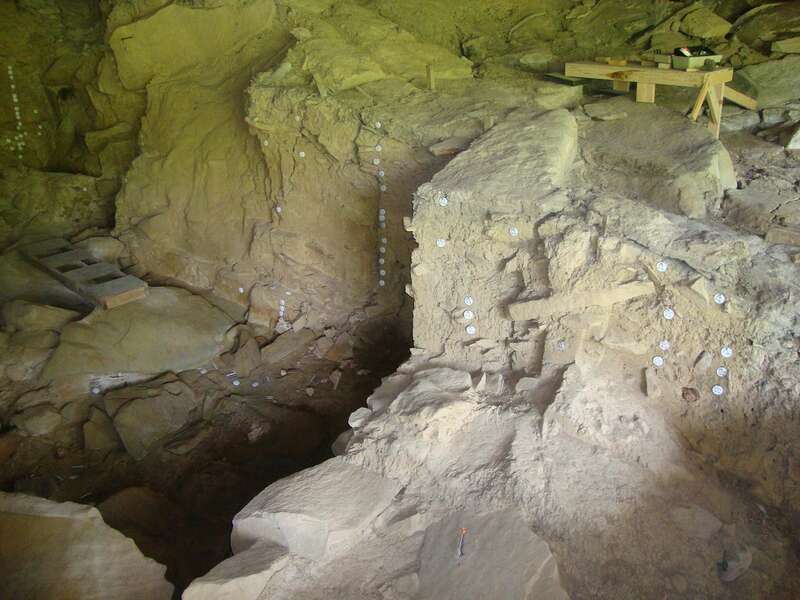 The hole may be evidence of a post once used at the site. Simple Basketry Fragments from Meadowcroft. 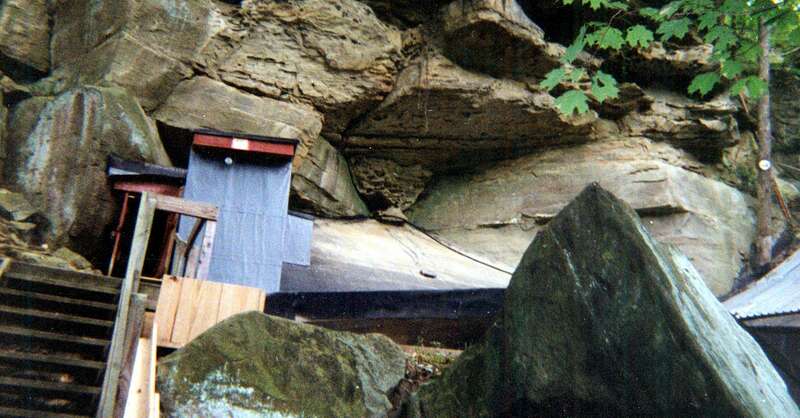 Large Basketry Fragment photographed in situ at Meadowcroft Rockshelter. 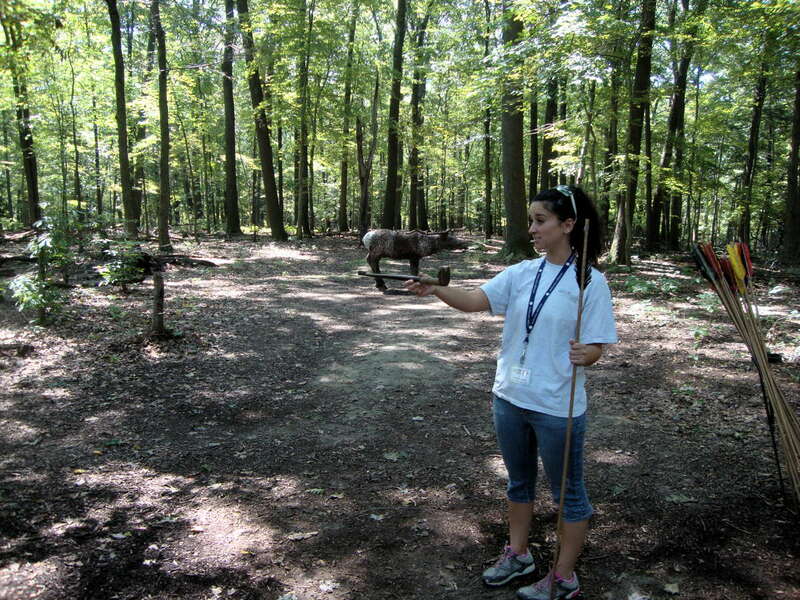 Archaeologists found an assortment of bone objects at Meadowcroft. Many of the bones were those of animals used for food. 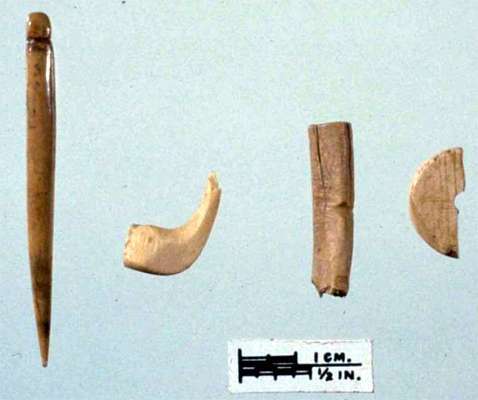 The objects pictured here are bones shaped by human craft, including the awl located at left and part of a bone or ivory disc at right. 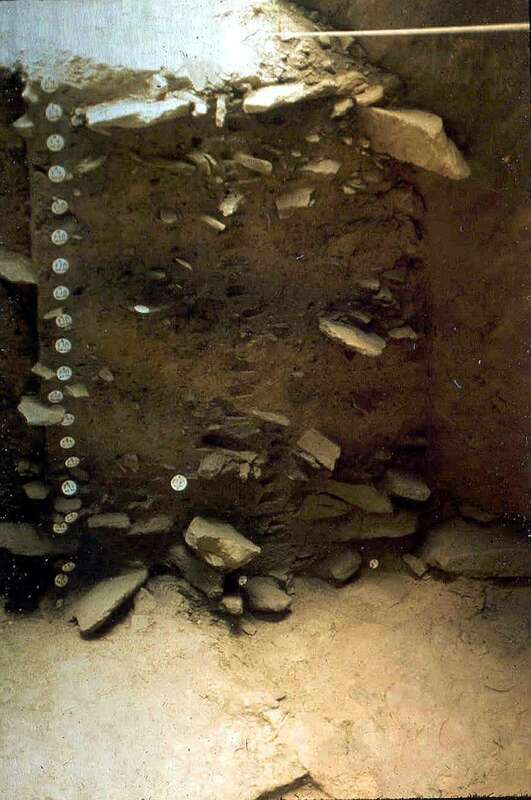 A scanned colour image of the site (ca 2006?) 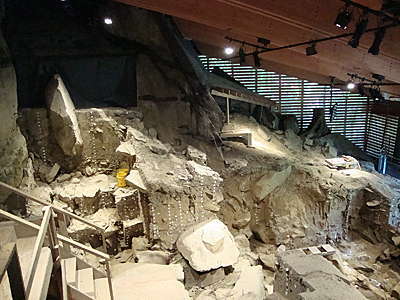 after temporary roofs were built to protect the site, but before the 2008 structure was built. It was found necessary to roof over and close off the opening to the cave, as during one winter the site had been vandalised by locals, looking for arrowheads. 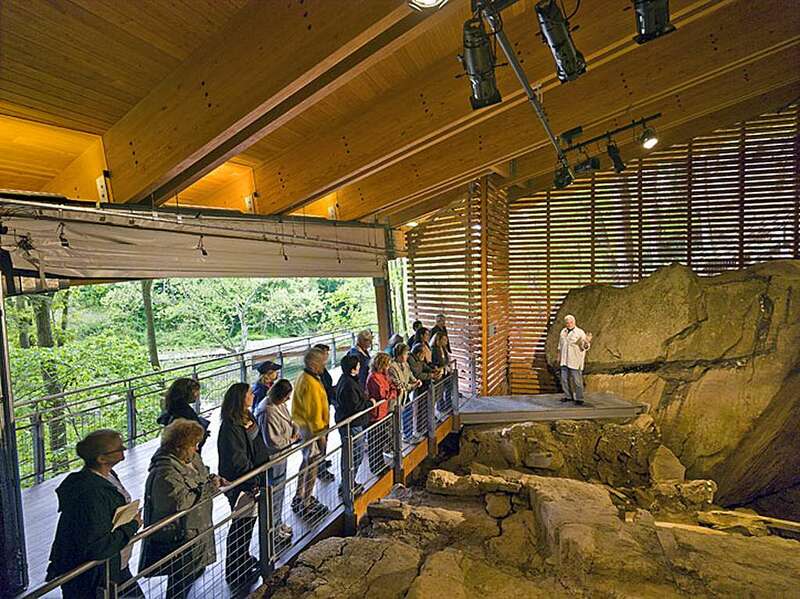 The new enclosure and roof allows for protection of the site, and the ability of viewers to see the entire site without interfering with the ongoing scientific studies. 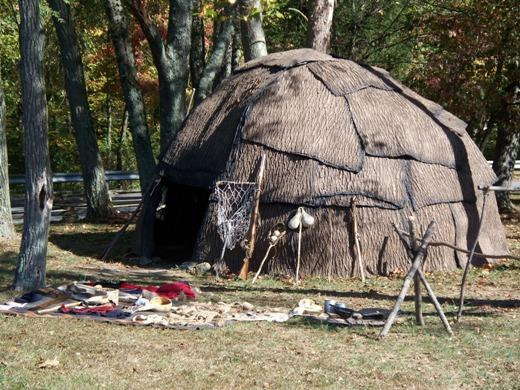 The shelter was used occasionally for periods of one to three days at a time by small parties up till about 1750. 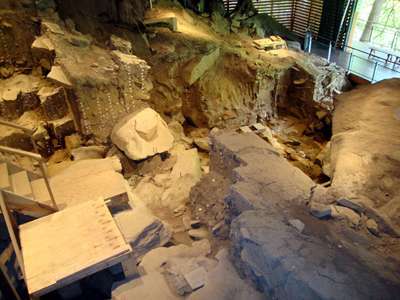 A big ceiling rock, shown in this photo on the right, is believed to have fallen around 12 000 BP and has yet to be removed. 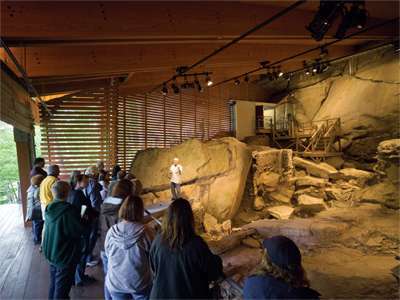 Dr. James Adovasio, who began excavating at the Meadowcroft site in 1973, treats rockshelter visitors to his expertise on the subject. This photograph shows the professional quality of the roof and walkways which have been erected to both preserve the site, and to allow visitors the chance to see a working archeological dig. From the same lecture, showing the other entry for visitors at the back of the shelter. All excavations are meticulously recorded, and the white circular tags record places where important finds such as artifacts were discovered, or where carbon-14 dates have been determined. The site used rigorous methods for all excavations, in excess of what was 'required' at the time, but necessary once the results came in, and the dates showed the lowest deposits to be pre-Clovis. 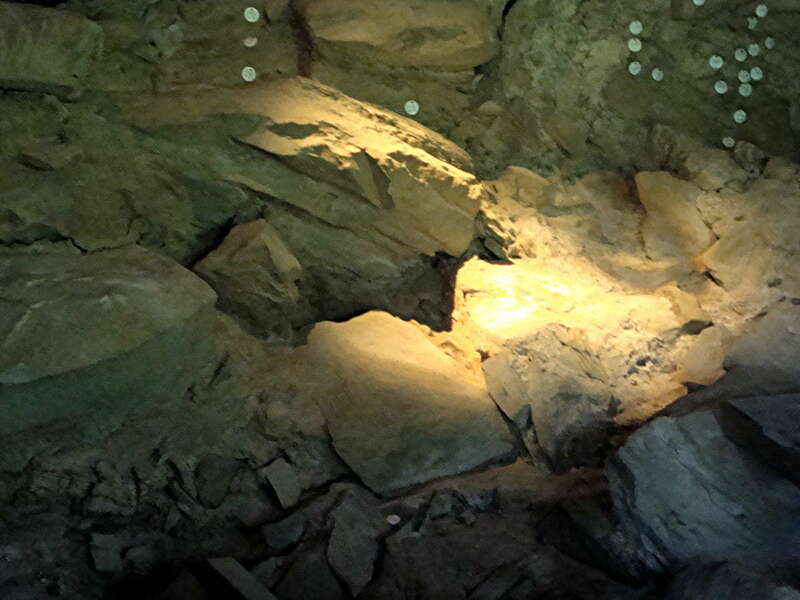 Some parts of the site have been left unexcavated, to allow for later research. 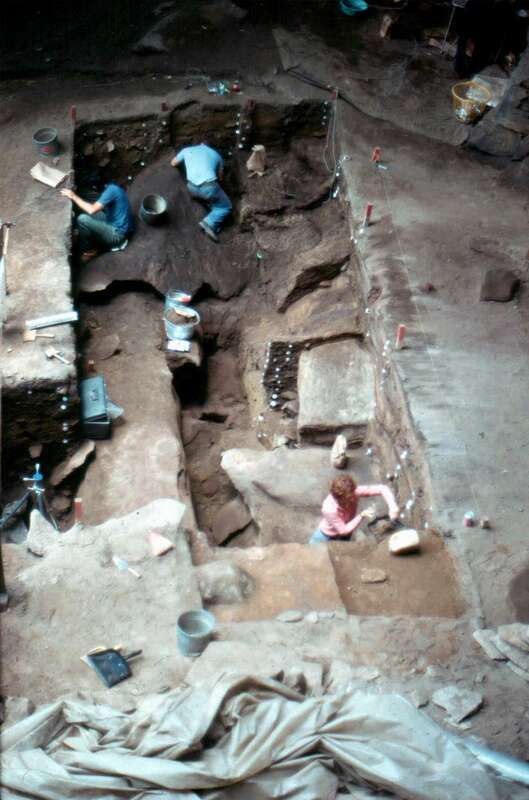 An important series of shots of the dig, photographed in series from the back to the front. 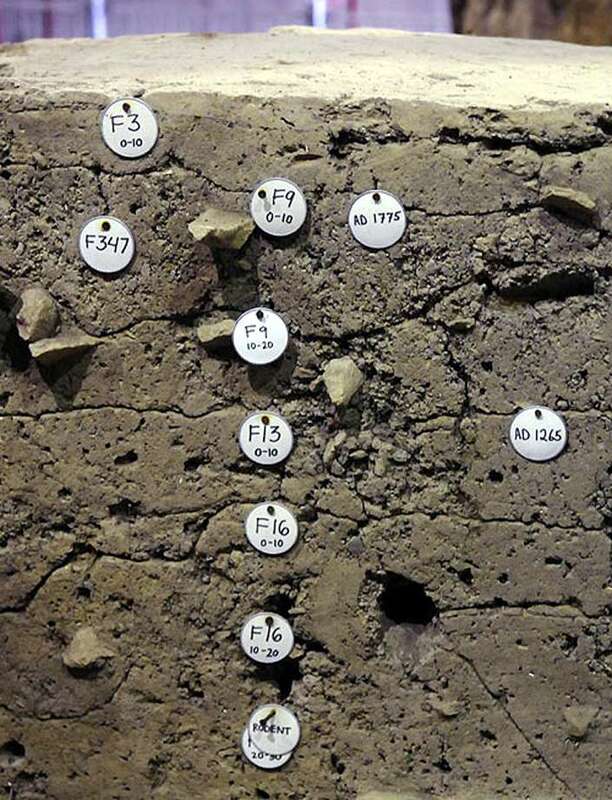 Hundreds of years of history are revealed in this labelled work face. The top level is 1973; the top right tag labels 1775, and the tag at middle right labels year 1265. A new enclosure has been built over the site so it can be opened to the public. 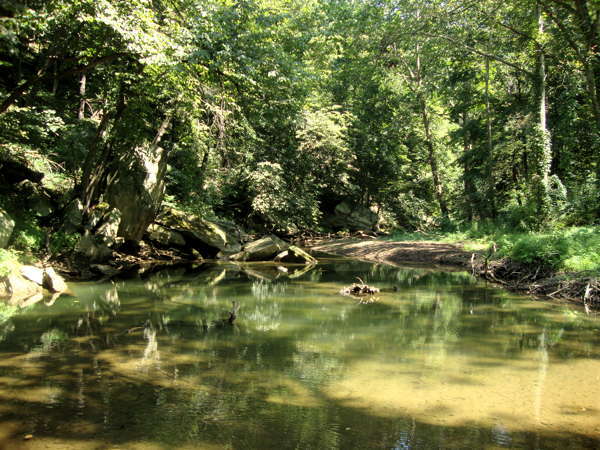 Cross Creek, where the original inhabitants would have got their water, is a magical place, with no sounds but the rustling of the breeze in the trees, the birds, and the creek flowing by. 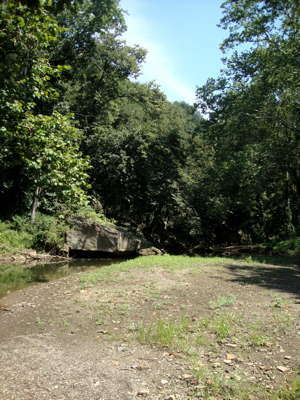 Travelling down Cross Creek, we come to what appears to be the remains of a former bridge, with the rock shelter just up the slope from that point. 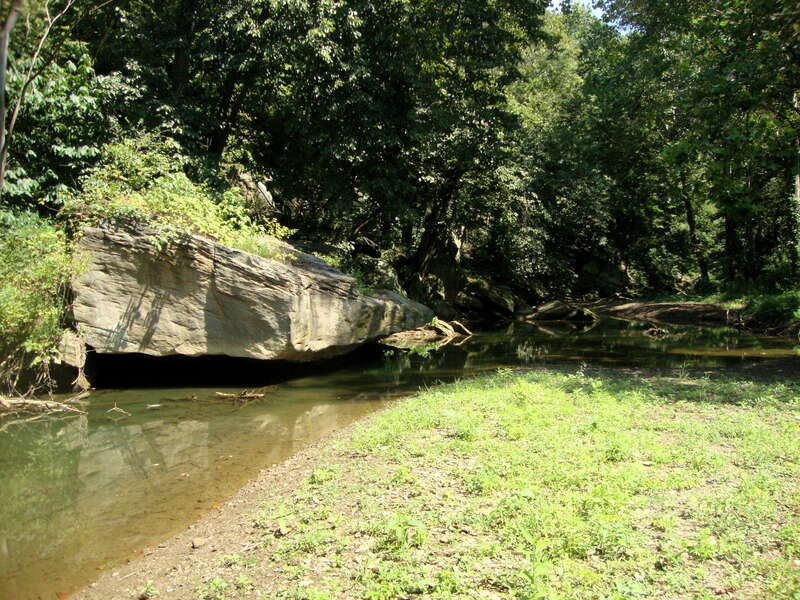 Walking further down Cross Creek, we can see a sandstone shelf jutting out above the water. Further down still, the forest closes in, giving a view of what the area must have been like thousands of years ago. 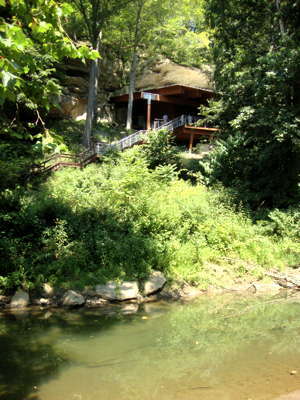 Above the rock shelter is a river terrace or bench, where a visitor centre has been built. 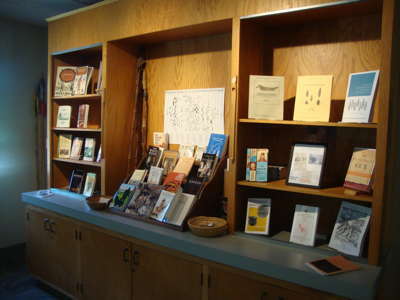 The visitor centre is well built and organised. These tools are reproductions on display at the centre. The tools and reproduction artifacts have been beautifully presented. 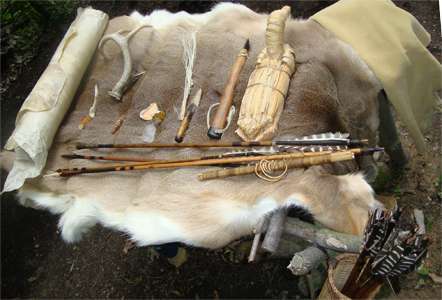 Woven quiver, arrows, and furs. This knife was as sharp as a razor. Many enthusiasts are very skilled in reproducing ancient tools and artifacts to the same high quality as ancient specialists. 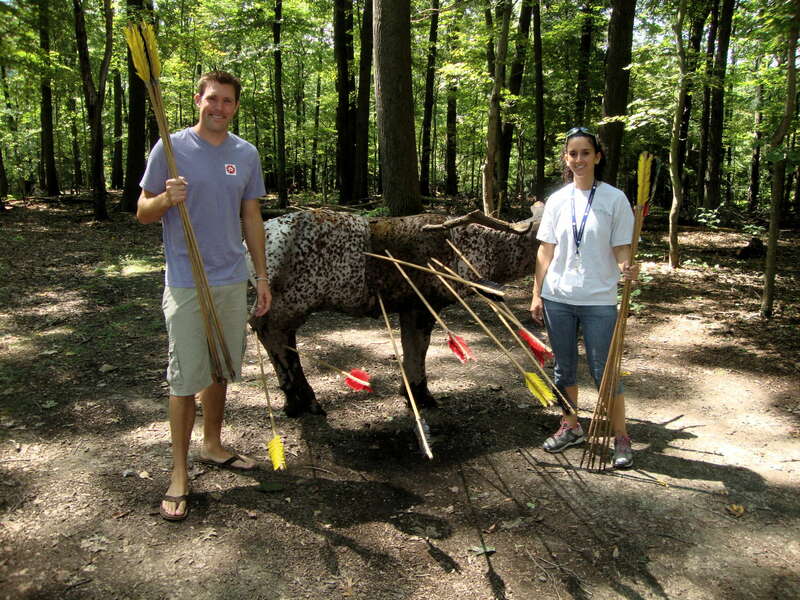 Joe Candillo is the man who has made all the arrows, bows, and tools shown above. 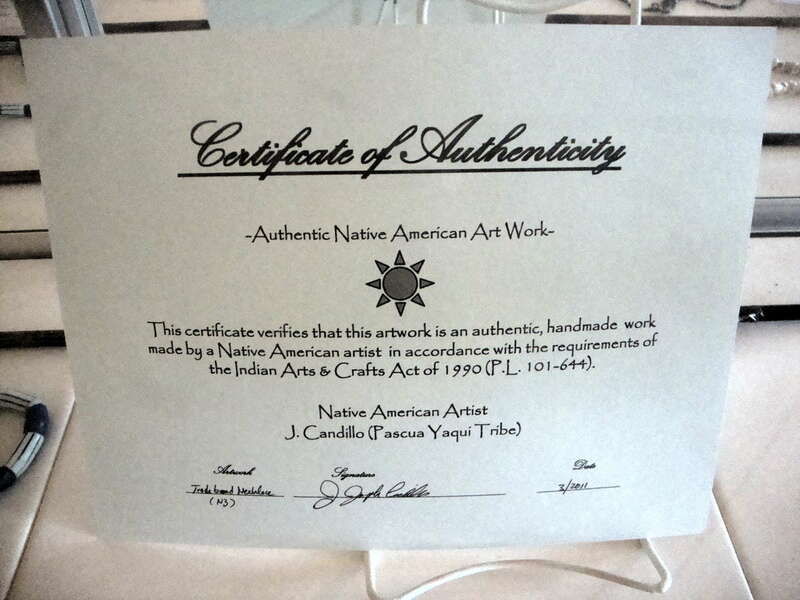 He is not only a consummate artist, he is currently pursuing a PhD in American Studies at the University at Buffalo with a concentration in American Indian traditional arts. 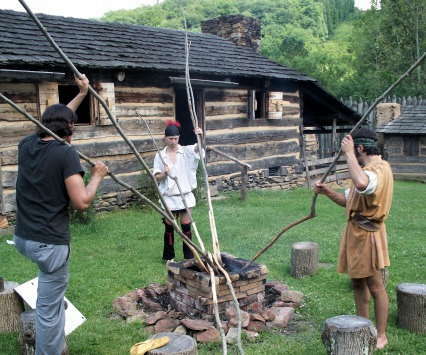 It is a fascinating website which details living history behind the scenes at Pricketts Fort, where Pricketts Creek joins the Monongahela River in the foothills of the Allegheny Mountains. 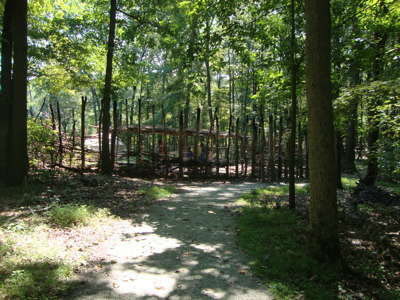 In recent days a new structure has appeared in a grove of trees within sight of Pricketts Fort, an Eastern Woodlands Indian wigwam. Constructed by Joe Candillo and his father John, members of the Pascua Yaqui tribe, with help from Pricketts Fort staffers Michael Ray (potter & militiaman) and Aaron Bosnick (native interpreter), the work gets underway on 6th June 2008 when the Candillos pull up to the fort with a trailer-load of cut saplings: hickory, ash, oak and other hardwoods. 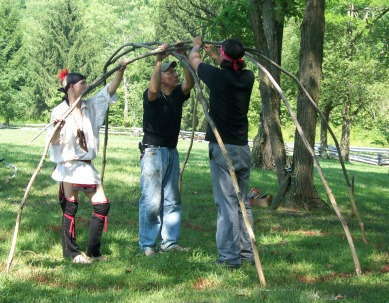 The first step, shown here, is to strip the bark from the lower end of each pole. 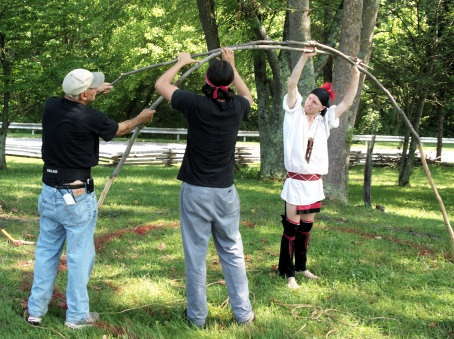 The next step is to char the stripped ends of each pole in a fire. This hardens and dries the wood, and provides a barrier to rot, mould and insects. Then, using the circular outline of the structure marked on the ground, the first two poles are set in place to form the initial arch. Further arches are then added to stabilise and strengthen the framework. Once all the arches are in place, horizontal stringers are added one at a time, beginning at the top & working down, not forgetting to leave an opening for the door. 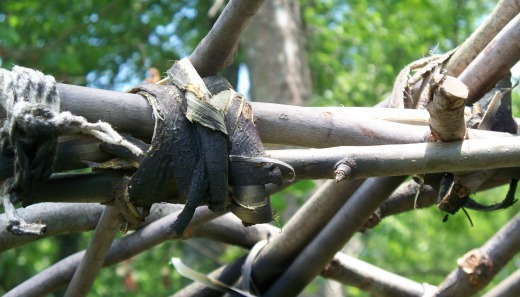 The intersections are firmly bound with cordage and strips of bark. 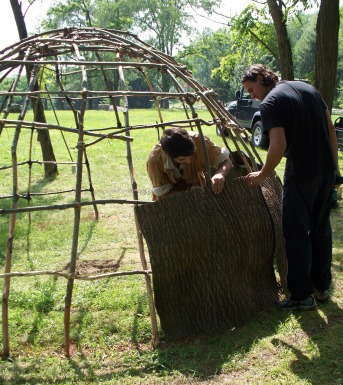 At this point the frame is ready to receive large sections of bark, which are fastened around the base first, with successive layers overlapping the one below to make a weatherproof structure. 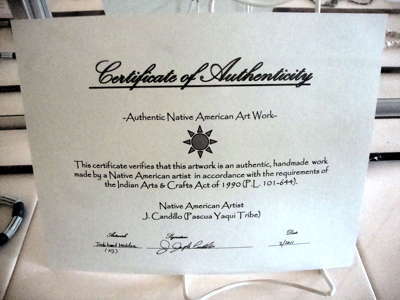 The completed wigwam. It is a comfortable and weatherproof shelter. 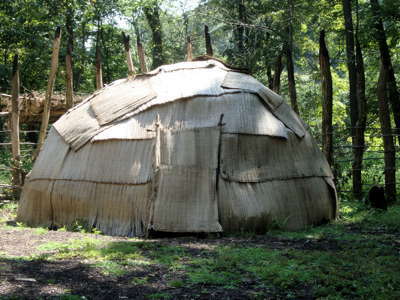 A similar wigwam at Meadowcroft, also made by Joe Candillo, but covered with grass matting instead of bark. When funding is available, a more authentic covering will be substituted. 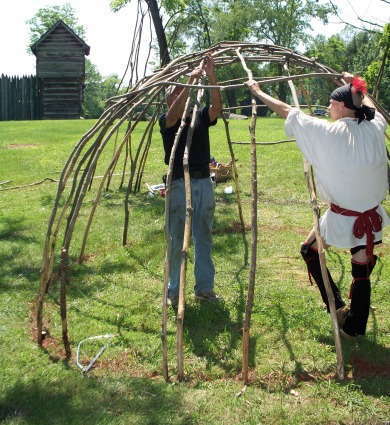 Wigwams varied in size ranging from seven feet to about twenty feet in diameter. The frames of Eastern woodlands wigwams were made from bent saplings and covered with reed mats and bark. In Northern areas where birch were plentiful , bark was stripped from the trees and sewn together with spruce root into rolls as long as fifteen feet. 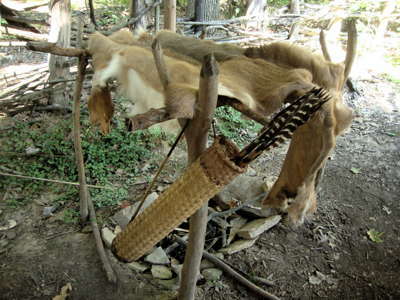 These were called apakwas by the Chippewa. Visitors can try their hand at an atlatl or spear thrower. 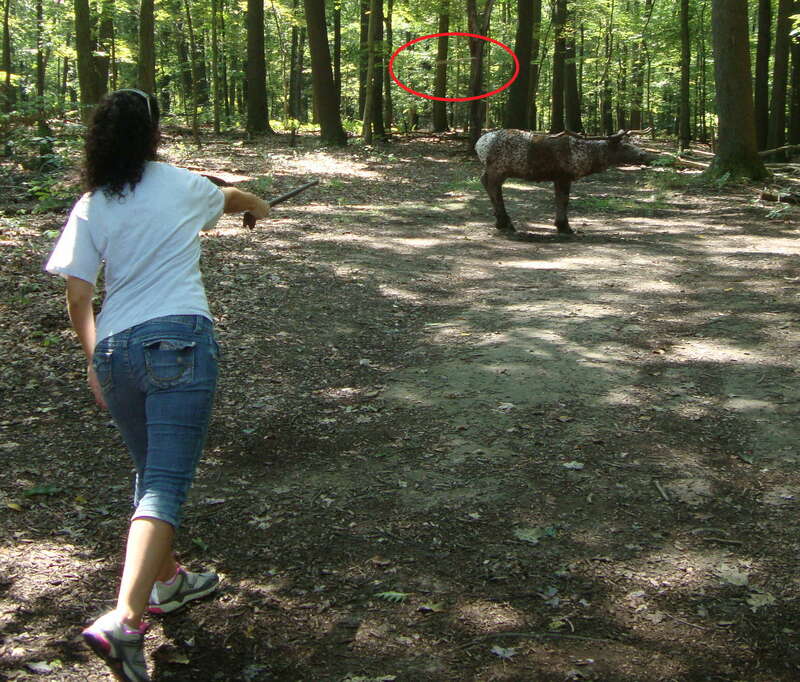 The photo on the right has the dart shown flying through the air. Even beginners can get the hang of the method, though much practice is required to get consistently accurate long range shots. 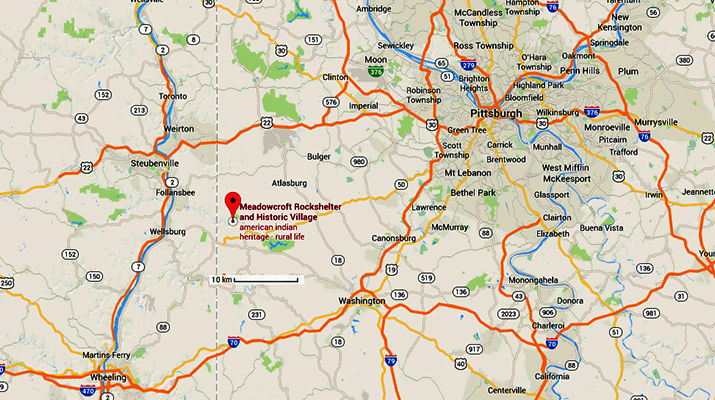 Key sites in the general area of which Meadowcroft Rockshelter is one. Flint sources in the general area of Meadowcroft Rockshelter. In particular, Flint Ridge Chert (or Chalcedony) has been identified in the lithic assemblage. Meadowcroft Rockshelter is located on the property of Meadowcroft Village, a restored predominantly 19th century, rural community operated by the non-profit Meadowcroft Foundation. 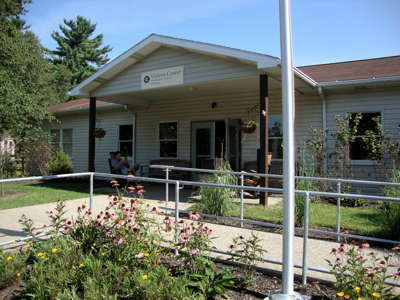 The village was developed by Albert and Delvin Miller (Vice-President and President, respectively, of the Meadowcroft Foundation) on a portion of their old home farm presently some 800 acres in extent. The farm and the rockshelter have been in the continuous posession of the Miller family since 1795. The original patent of the 1780s was a Virginia land grant. 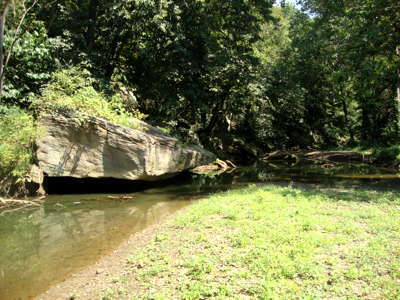 Due to its location within the precincts of Meadowcroft Village as well as the specific protection afforded by Albert Miller even prior to the creation of the village, the rock- shelter has escaped serious despoliation. 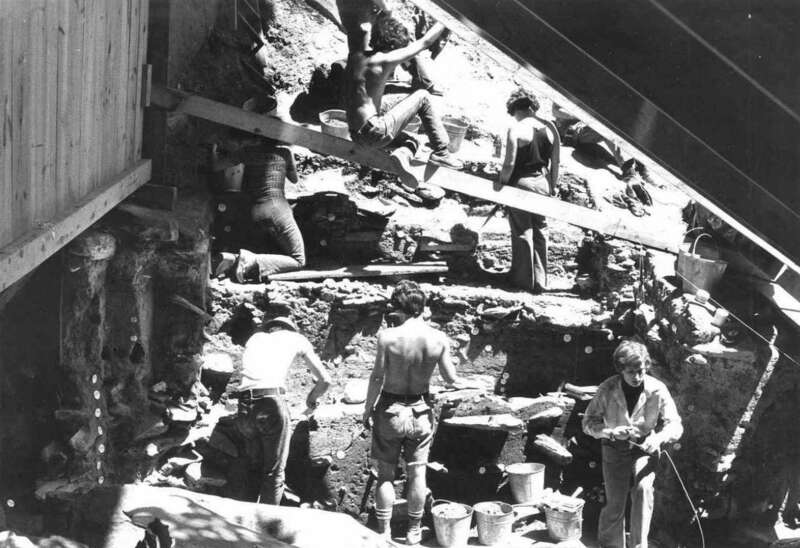 The archaeological potential of the shelter was long suspected by Albert Miller though he refrained from any excavations until 1967. In that year, his enlargement of a badger(?) 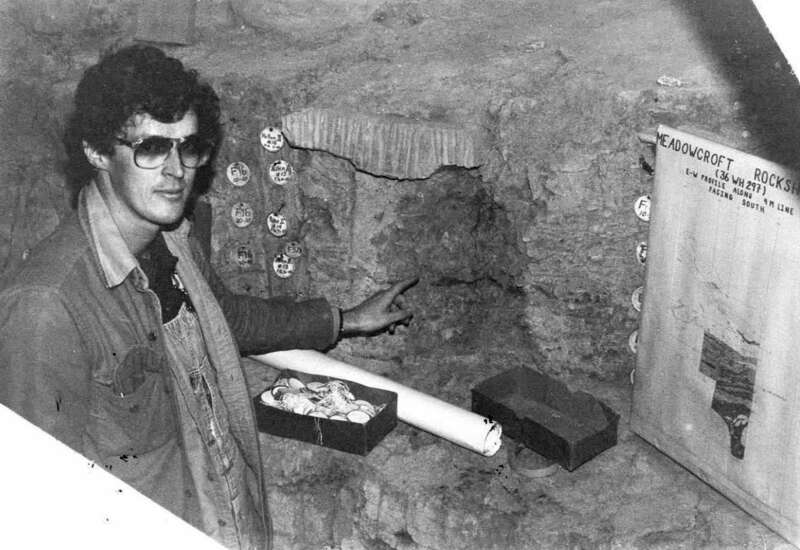 burrow yielded lithic debitage, shell and faunal remains confirming his suspicions of aboriginal occupation at the shelter. Efforts to interest professional archaeologists in the site resulted in its recording in 1968. 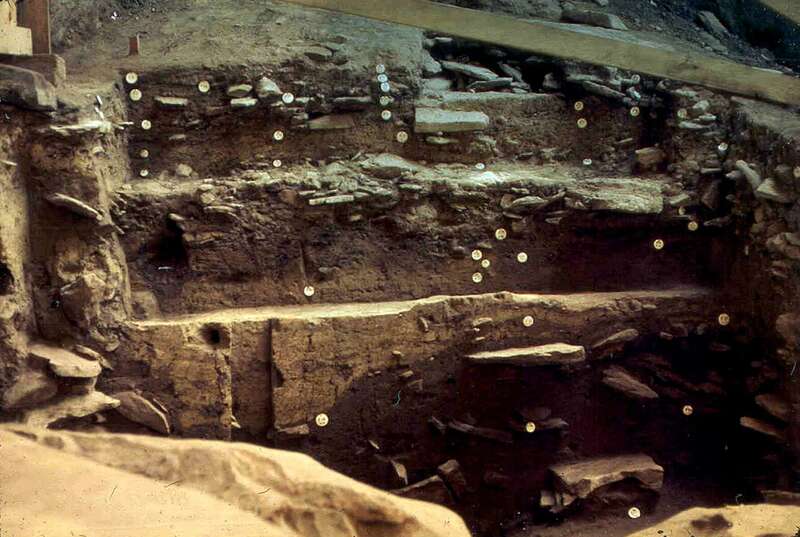 For one reason or another no excavations were initiated and the site remained, with the exception of the original ca. 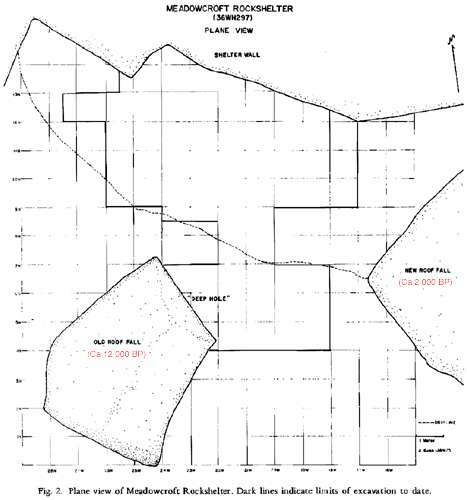 60 x 60 x 60 cm Miller "badger" hole, untouched until 1973. 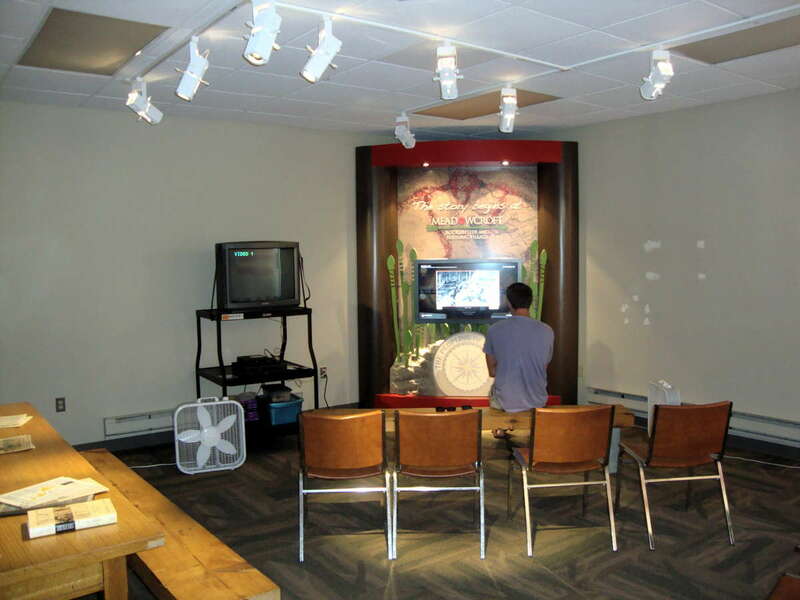 Source: Heinz History Center, an affiliate of the Smithsonian Institution, Pennsylvania's largest history museum. 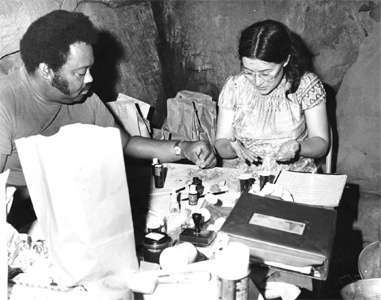 During the spring of that year, the site was brought to the attention of the Department of Anthropology, University of Pittsburgh. A visit to the shelter and a subsequent test excavation culminated in a formal application to the Meadowcroft Foundation to initiate major excavations in the summer of 1973. 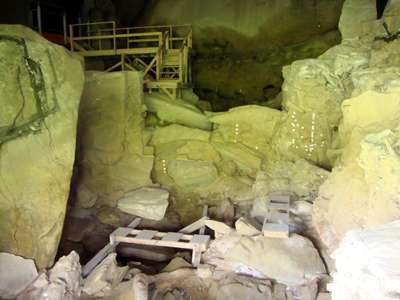 Permission for the proposed work was immediately forthcoming and the 1973 excavations were begun in mid- June and terminated in late August. The results of the first season warranted a second and work was resumed in early June 1974 and terminated in early September of that year. During the 102 working days of 1973-1974, some 57.95 m2 of surface area were excavated resulting in the removal of 98.55 cubic meters of fill. 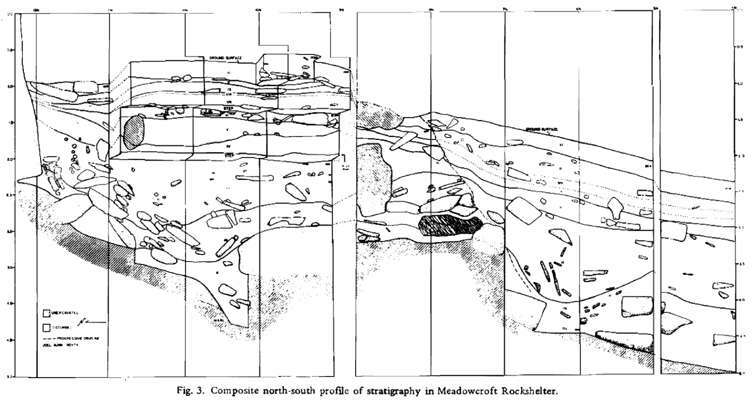 In addition to the excavations at Meadowcroft Shelter, a massive multi-period settlement pattern study of the entire Cross Creek drainage was begun in 1974. 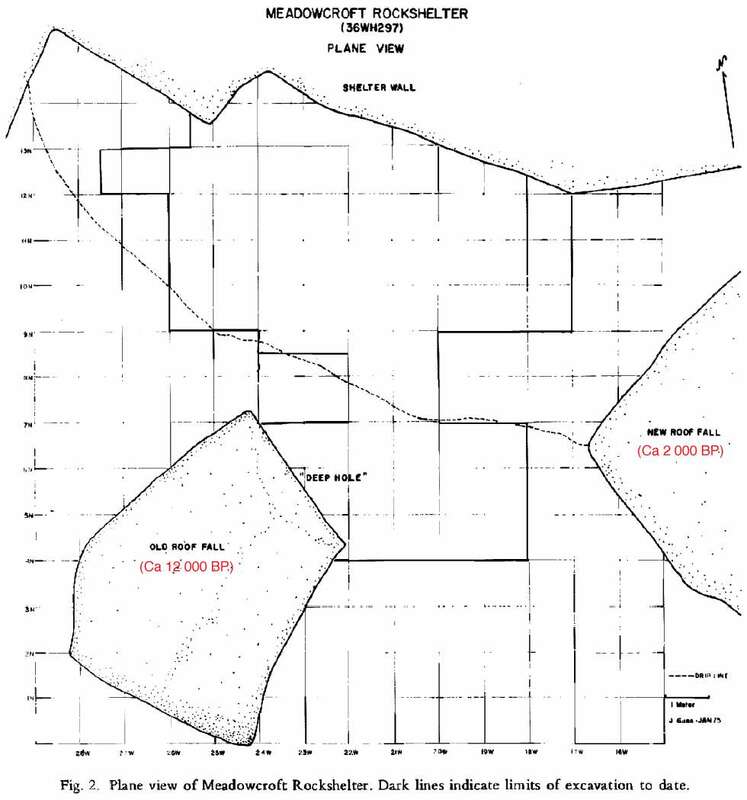 General plan of the excavation. 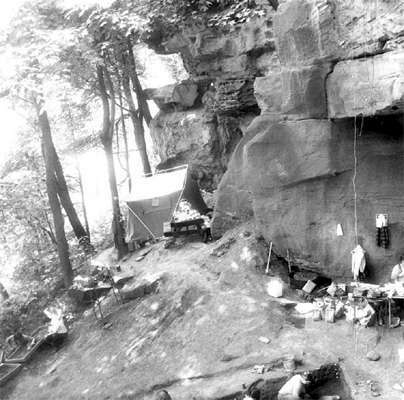 University of Pittsburgh Archaeological Research Program Field School at Meadowcroft Rockshelter, July 19, 1973. 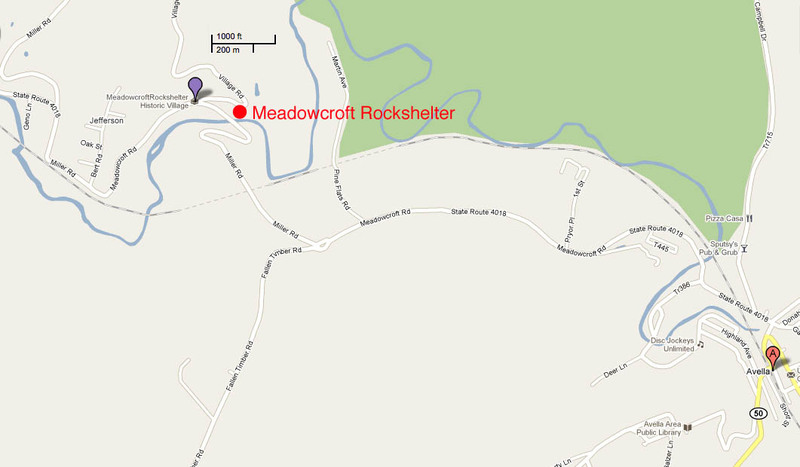 The Meadowcroft archaeological team lived on site during field school excavations. 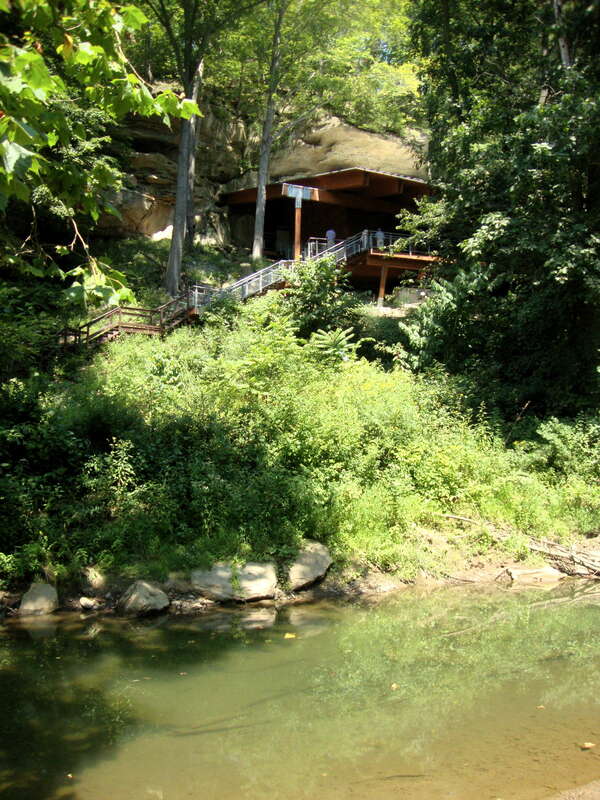 Their large tent is dwarfed by the overhanging rocks near the Rockshelter. In the lower left of the photograph, student archaeologists sift soil removed from the excavation site. 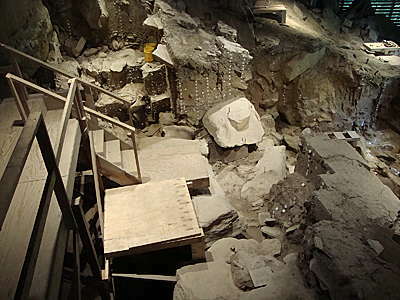 At the lower right, tools and equipment clutter the entrance to the site. Archaeologists are engaging in a number of excavation- related tasks, including digging and record-taking. Buckets of removed soil and tools wait nearby. Date B.P. +/- Uncorrected Date B.C. Cultural Association Lab No. Archaeologists work at a field lab station in the Rockshelter, sorting and numbering artifacts for identification purposes. 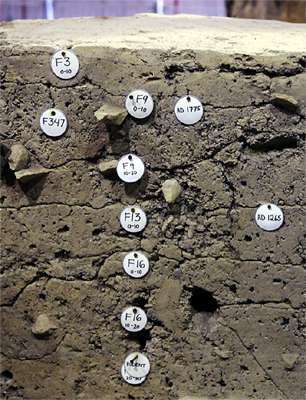 Archaeologists paint a small white spot on each artifact and then use black ink to write an identification number. Numbers are logged on a field form at the right in the photograph. 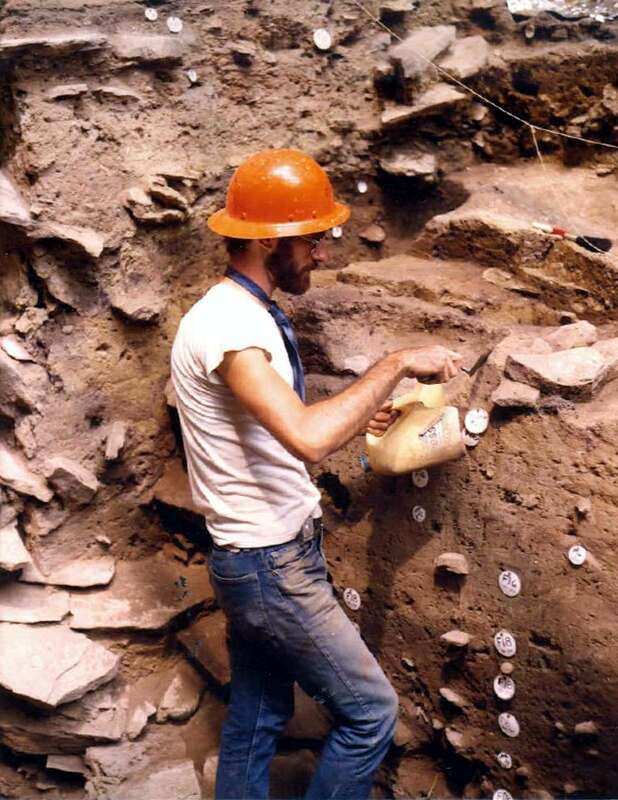 An archaeologist uses a trowel and dustpan to remove soil from the excavation site. Other tools wait on the ledge above him. Excavating must be done slowly and carefully! 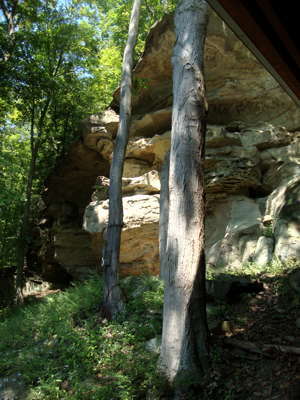 Many of the total of 11 strata at the Rockshelter are visible on the east wall. 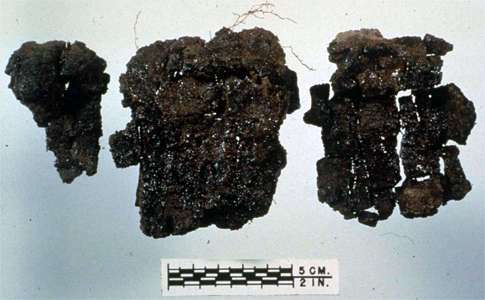 The white tags are feature markers, indicating where pieces of evidence, such as artifacts, are found. 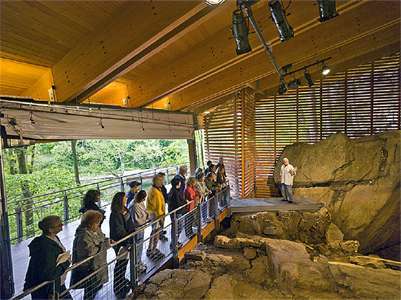 When Professor John Adovasio published results for dating of the Meadowcroft Rockshelter site at 16 000 years, he found himself at the centre of a storm of scientific debate. 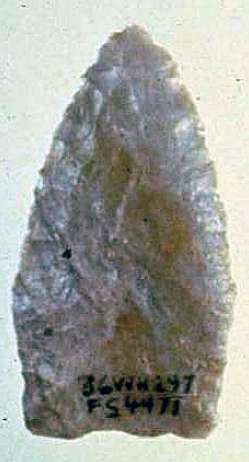 The prevailing opinion amongst archeologists was that no site in the Americas was older than the 13 000 - 13 500 year old Clovis culture, characterised by an iconic projectile point which uses bifacial percussion flaking to produce a relatively thick but symmetrical point, with concave longitudinal shallow grooves called "flutes" on both faces, one third or more up from the base to the pointed tip, allowing it to be attached to a wooden dart thrown by hand or by a spear thrower (also called an atlatl). Since that storm erupted, Professor Adovasio has shown that the criticisms are without foundation. Meadowcroft is one of the most carefully excavated and dated sites in the world, and since the controversial dates were published, other sites have been found in the Americas of similar age. 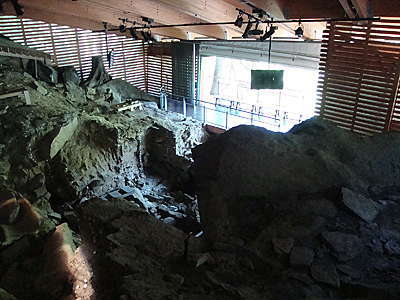 In 1999, a remarkably well preserved site at Monte Verde, Chile was found to have been inhabited 14 800 years BP, thereby breaking the Clovis First barrier which had stood for fifty years. 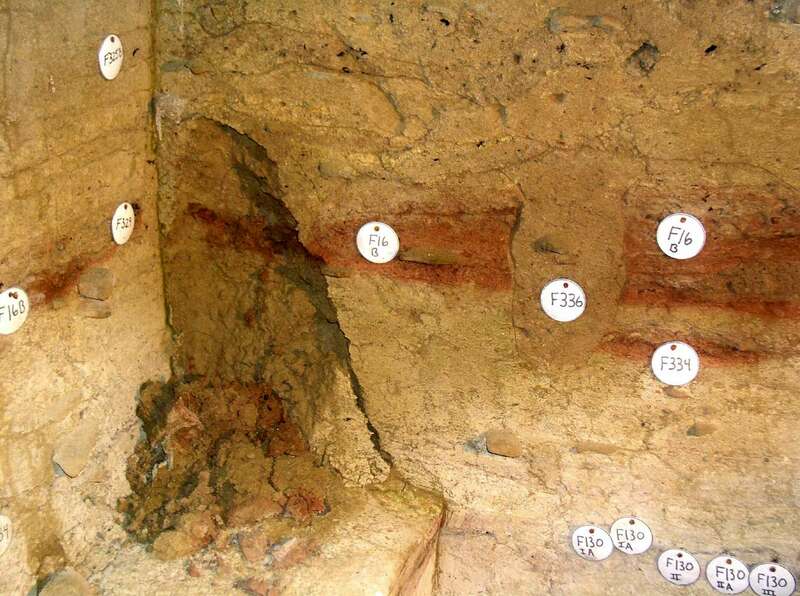 More than a dozen sites indicative of human habitation before 13 500 years ago have now been discovered throughout North and South America. 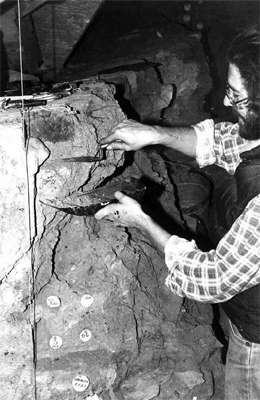 Adovasio, J., Gunn, J., Donahue J., Stuckenrath, R., 1975: Excavations at Meadowcroft Rock Shelter, 1973-1974: A Progress Report. Pennsylvania Archaeologist 45(3), pp.1-30. Boldurian, A., 1985: Variability in Flintworking Technology at the Krajacic Site: Possible Relationships to the Pre-Clovis Paleoindian Occupation of the Cross Creek Drainage in Southwestern Pennsylvania. Unpublished doctoral dissertation, University of Pittsburgh.